You don’t have to hang around MIT long to find out that the concept of learn-by-doing is alive and well. One tangible example is the UROP program (Undergraduate Research Opportunities Program), started in 1969 by the late Prof. Margaret MacVicar, MIT’s first dean of undergraduate education, who acted on a suggestion by Dr. Edwin H. Land, inventor of instant photography (Polaroid), who believed every student should have a faculty mentor, doing research projects at the knee of the master, as he once described it. Dr. Seymour Papert of the Media Lab furthered the philosophy, taking the theory of constructivism he learned when he studied under Jean Piaget and extending it to the theory of constructionism, by which the learner creates tangible forms (language, tools, toys) to explore and better understand ideas, then shares what is learned with others. Civic or community journalism is a manifestation of constructionism where practitioners learn by doing and share their explorations. And textbooks continue to be essential in the education scheme, whether on paper or online. Indeed, community journalism is now reaching the point of maturity where practitioners’ books and handbooks will emerge based on grassroots experience. In some cases more than ten years of online publishing has been accrued by volunteer and commercial community publishing groups (one of the earliest and still chugging along is the “Melrose Mirror” at http://melrosemirror.media.mit.edu, which will be starting its 15th year in June). 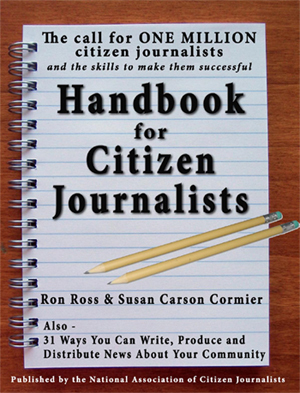 Worthy of note is the new “Handbook for Citizen Journalists”, with Part One written by Ron Ross and Part Two by Susan Carson Cormier, on behalf of the Colorado-based National Association of Citizen Journalists (NACJ). It’s half motivational and half tutorial. The motivational aspects were a surprise to me until I discovered that Ross is a former pastor and missionary. A bit of an unorthodox approach, it does confront what in my experience is the biggest barrier to entry for most citizens: Having the confidence to cross the threshold. Once inside the door there’s no turning back. Citizen journalism is fun and energizing. Cormier has a lot of media experience which is quickly clear in Part Two of the handbook. She also must have learned some teaching pointers from her father, Donald W. Carson, a nationally noted journalism educator at the University of Arizona. She effectively uses the tried-and-true approach: tell the learners what you are going to tell them; tell them; then tell them what you told them. They also stick out their chins in describing “accidental journalists” and “advocacy journalism”. My view? We could argue that point endlessly and get nowhere. Keep those cameras handy. Advocacy journalism is a genre of journalism that adopts a viewpoint for the sake of advocating on behalf of a social, political, business or religious purpose. It is journalism with an intentional and transparent bias. Which do you want to do? Either way, itís okay, but you must decide whether to be an advocate or a dispassionate reporter of news. One is a citizen advocacy journalist; the other is a citizen journalist. I happen to agree with that but probably would be hard-pressed to find anyone on my side in an academic debate. For me this has the ring of licensing, a dangerous precedent. Without going down that road (at least not in his article), press badges, except for such situations as covering the President or having access to limited space in a sports press box, have little practical use. How about just a plain old business card that names your organization and provides its URL? I am part of a community publishing group that decided to make up laminated cards with photos on them for its members about four years ago. Everyone liked the idea; I stuck mine in a drawer. No one ever used theirs. Nevertheless, the thrust of the NACJ handbook is more pedagogical than preachy, even referring readers to a YouTube site for pointers (youtube.com/reporterscenter), despite having their own YouTube instructional clips (youtube.com/thecitizenjournalist). Citizen journalists need more exposure to know-how, not so much from professionals as from those who have had grassroots experience. The enthusiasm for learning is there. Next post MIT 100K Fail!